The process was fairly simple on this one. I masked the sun and the horizon line with post it notes then began sponging with Sahara Sand; darker at the top of the sky and lightening as I moved towards the horizon line. I followed the same process with the Basic Gray. I added a little more Basic Gray along the horizon line to give it definition. I then took my masks off and flipped them so I could work on the ground and the water. 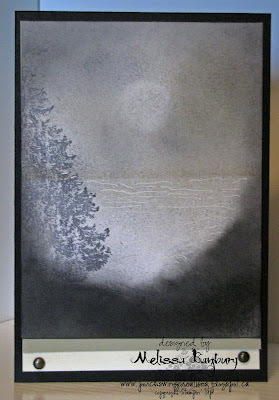 I sponged Basic Gray and Basic Black on the ground area and Sahara Sand lightly through the water, finishing by adding the tree in the foreground and ripples in the water with my white gel pen. Thanks so much for looking and have a great, safe long weekend!! 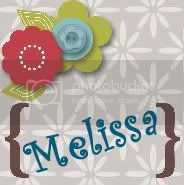 Melissa you are "uber" talented. Love your various cards and beautiful masking and sponging techniques. Your masculine cards are awesome. TFS. I'll be your latest follower from SC.